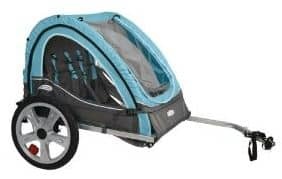 Right now at Amazon you can purchase the InStep Take 2 Double Bicycle Trailer for only $70.00 (regularly $99.99) + receive FREE shipping! My husband and I have been debating purchasing a bicycle trailer for a while so I've been watching prices and this is the lowest one I have seen. If you are wanting to ride your bicycle and take your little ones along then this is the perfect answer.